Please help support us by donating . Would you like support with your charity event? What is the Barrhaven Food Cupboard (BFC)? BFC is a community-led organization that provides food assistance to families in need in the Barrhaven area through the generosity of our community. How did the Barrhaven Food Cupboard get its start? Originally we were part of the Family Services Association of Churches (FAMSAC) food bank that was founded in 1969 in Bells Corners. 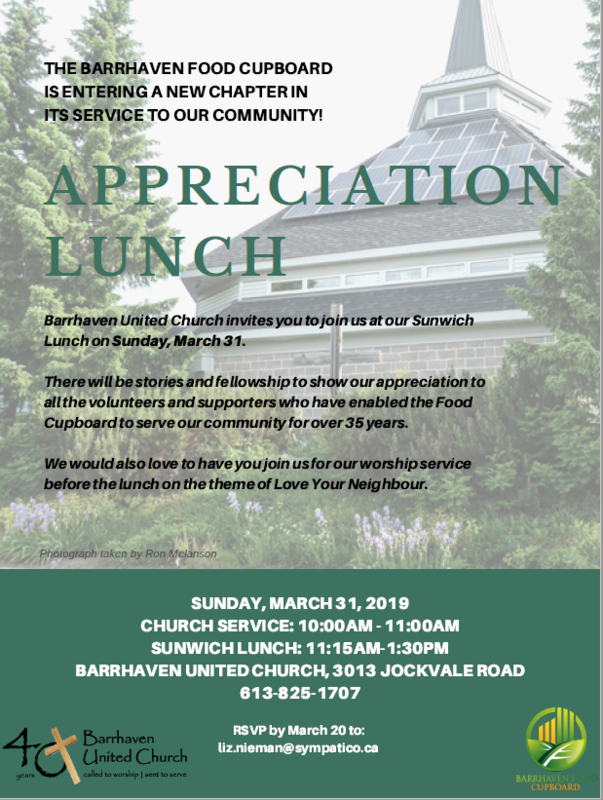 In 1993, the Barrhaven United Church set up a separate food depot as an outreach activity when the church was built on Jockvale Rd. Since then we have grown. The Barrhaven Food Cupboard has evolved into a community-led service that has operated autonomously from the church since 2005. And Barrhaven has grown too. The demand for our help is much greater, the population of the community more diverse. We have to move on to a larger space. We currently operate out of the basement of the United Church but will be moving to a new space in the Walter Baker Centre in Spring 2019. Though we are moving on, we are deeply grateful to the Barrhaven United Church for all the support we’ve enjoyed since we began. Even when the BFC became an autonomous community-run organization in 2005, the Barrhaven United Church continued to allow us to use church facilities free of charge. We are entering a new chapter in service to our community! Join us at for the Sunwich Lunch. There will be stories and fellowship to show our appreciation to all the volunteers and supporters who have enabled the Food Cupboard to serve our community for over 35 years. If you are in need of help please dont hesitaite to contact us.